It perhaps will come as no surprise to longtime readers of this blog that a Google search on the above phrase returns this site first. Geoffrey Wheatcroft recalls Cactus Jack in a 2006 Slate piece that asks "Can a drunk run the country?" On Capitol Hill, as well as Westminster, drink once oiled the political process. 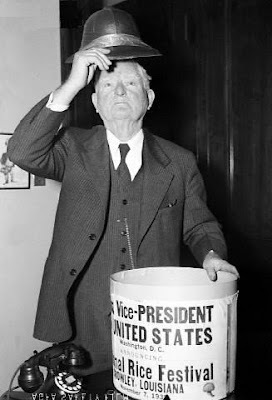 "Cactus" Jack Garner, the genial Texan reactionary who was FDR's vice president in the 1930s and who famously said that his job wasn't worth a bucket of warm piss, confined his work to asking senators in to "strike a blow for liberty" over a flask of bourbon, so much of which flowed that Cactus Jack had a malodorous urinal installed in a corner of his office. If he wasn't the best advertisement for the virtues of booze, the late Daniel Patrick Moynihan was a notably serious drinker who was also several cuts morally and intellectually above most of his Senate colleagues. More alarming were Richard Nixon's last years at the White House. After a good many evening martinis, he would call Henry Kissinger, and the secretary of state would grin silently as he passed around the telephone so that others could listen to their commander in chief's unbalanced ramblings. Since Nixon was in a position to blow us all up, this suggests a somewhat esoteric sense of humor on Kissinger's part. And yet it is not just patriotic pride to claim a special place for my country, from the time when William Pitt the Younger was prime minister in the 1790s while consuming three bottles of port a day. A contemporary jingle imagined him and his drinking companion Henry Dundas entering the Commons unsteadily: "Cannot see the speaker, Hal, can you?" "What, cannot see the speaker? I see two."